I just wanted to share these charming little cupcakes because they were so fun to make! One of my dear friends Aireka held an adorable barnyard birthday party for her son Joey. Folks, you KNOW you're getting old when you start attending birthday parties for your friends' children instead of theirs. Hah. I will be totally honest. I had no idea what to buy a 2 year old for his birthday. 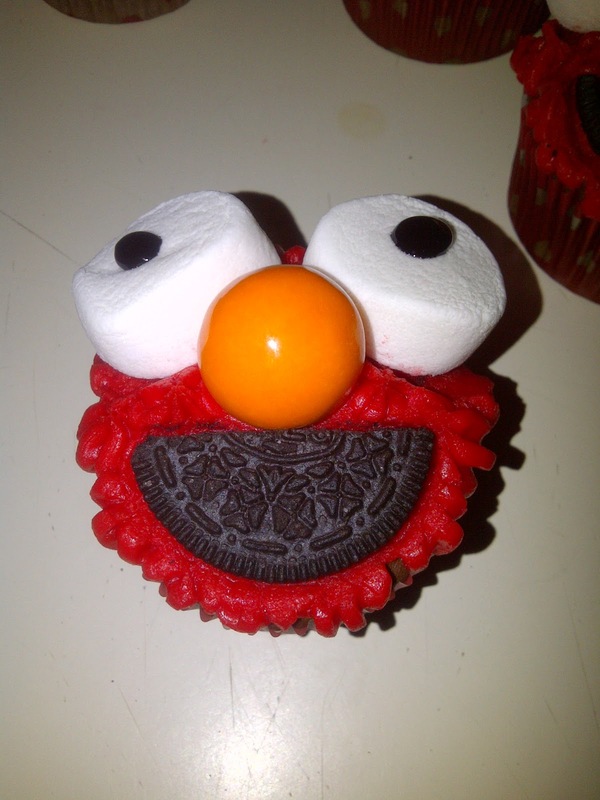 Aireka told me one of Joey's favorite characters is Elmo, so I decided to put my decorating skills to the test and attempt a cupcake that would look just like the furry little guy. I used the chocolate cupcakes and cream cheese frosting recipe from an earlier post to do this so I will save time not typing the recipe here, just head there to find it. I dyed the frosting red to match Elmo's fur. I will warn you that AT LEAST two bottles of red food coloring will be needed to dye the icing red. (I used three small ones!) I used halved marshmallows for the eyes and gumballs for his nose. Finished off the mouth with a halved Oreo. I have to say, they were the spitting image of the Sesame Street star. I baked my cupcakes. Made the frosting and then dyed it red. I used Wilton frosting tip #233 to pipe "fur" onto the cupcake. Halved the marshmallows and stuck onto cupcake while frosting was still "wet", you want the mallow to stick. Placed gumball right underneath eyes. Halved one side of the Oreo cookie (cream filling removed) and placed that right under the gumball. Used the black decorating icing to dot the center of the marshmallow to finish off his eyes. I also did an "adult" version of the cupcake. 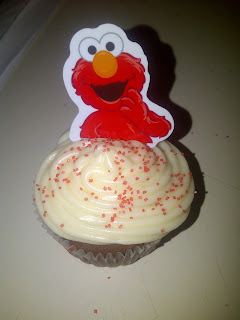 Used the plain cream cheese frosting and dusted with red sprinkles and Elmo tags. 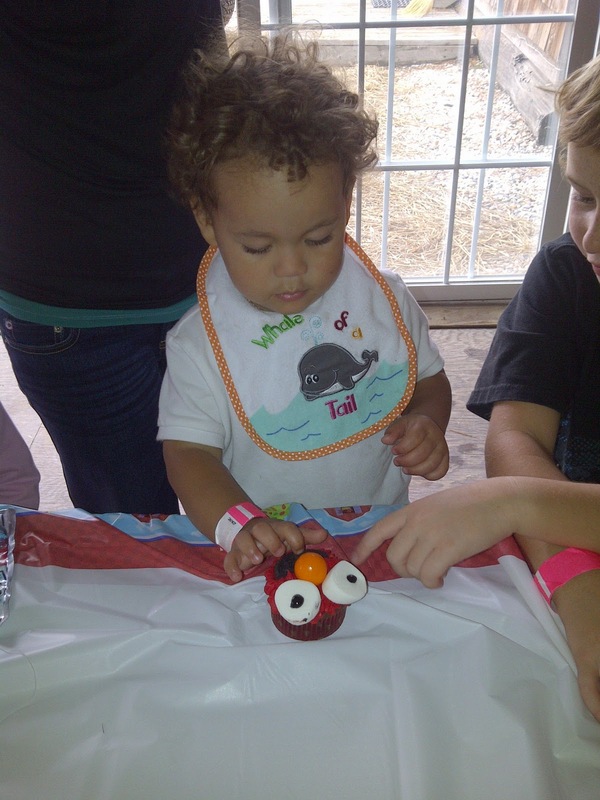 The birthday boy with his Elmo cupcake. Im making these today for a 2 year old's Elmo themed party! Im stoked! He is going to be sooo happy! I am so stoked to make these today!!! Im going to a two year olds Elmo themed bday party!